Trinity Director of Rugby Tony Smeeth (inset), while Trinity win a lineout against UCD during the 2018 Colours Game at College Park. There is a thick stack of envelopes on Tony Smeeth’s desk. The Trinity College Director of Rugby calls them ‘fishing letters’ and will send out 300 to the best Leaving Cert-studying rugby players in the country. Everything about the high performance programme he has built is included within, and it’s the beginning of a recruitment process that he must attack again and again, year-on-year with the same intense enthusiasm he brings when trying to unlock opposition defences. When Smeeth started in the college back in 1998, it wasn’t easy convincing top teenagers that Trinity was a rugby endeavour worth undertaking. 21 seasons on and with the senior team firmly ensconced in AIL Division 1A and this season securing a first ever playoff berth, his sales pitch hits its mark more often than not – even if he is still left scrutinising the CAO results as rigorously as a Department of Education official. “BES [Business, Economics and Social studies] goes up by ten and I lose five players to Commerce [in UCD]. My heart is broken every f*****g year,” he says, lamenting the vagaries of Ireland’s unique collegiate Sorting Hat. “We have 30 scholarships,” he adds. Trinity’s rise can be charted by the calibre of player it now attracts as well as it’s standing in club rugby. Top Leinster academy prospects like Ryan Baird, Jack Dunne and Liam Turner are studying and playing there. A professional player coming through Trinity – like Jamie Heaslip in Smeeth’s early days – was once an anomaly. Now they are peppered around campus studying everything from business to theoretical physics. The club’s future is contained somewhere amongst those 300 letters, the present sees the senior team in their strongest ever position and the U20 side the All-Ireland champions, while the past is the roughly 7,500 day quest Smeeth has been on since he first got his boots muddy at College Park in ’98. After spending a decade coaching in America, Smeeth returned for a role at Blackrock RFC but was always interested in the US collegiate sporting model and how it could be applied in an Irish context. He ended up swapping Blackrock for Trinity and set about changing everything about the place. The team was initially filled up with graduates but Smeeth quickly put an emphasis on recruiting and playing students, with a soft ‘five years then you’re done’ rule now in place. Hence the importance of that stack of envelopes in keeping the cupboard stocked in lieu of being able to call upon a cast of grizzled veterans. Progress through the leagues wasn’t always linear – starting in Division Three, then down to four, back to three, into two, up to one, back to two and now settled in the top flight and two games away from the ultimate prize. But how do you compete with senior teams when you’ve a roster full of youngsters still eligible for U20 rugby? Ask any current or former player and they will talk about the early-morning gym sessions. Monday morning fear swapped for the highlight of their week, it’s almost as important for the camaraderie as the gains made on the scale. “We train like a pro team,” Smeeth says. “We are the alternative academy,” he adds. 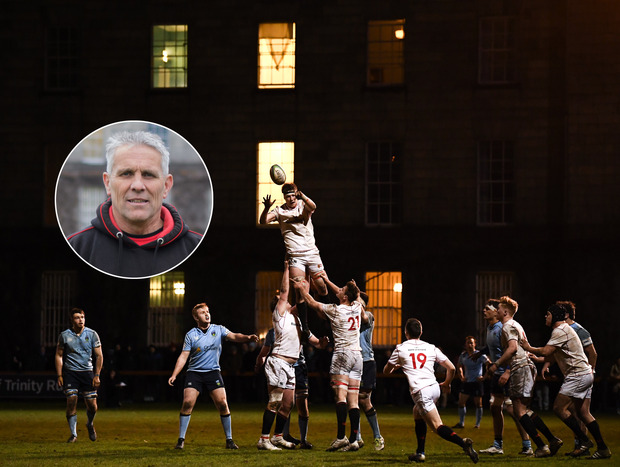 Nobody works alone, and Smeeth would be the first to recognise the massive contributions of people like forwards coach Hugh Maguire and club officer Kay Bowen – but there is no denying that the English coach’s fingerprints are all over the college’s rise. Smeeth coaches the Trinity seniors, U20s, attends every gym session, pitch session and match – and also takes charge of the Willow Park U13 team as well as occasionally helping out with the Blackrock College SCT. On top of what could be 15 rugby gatherings per week, his former players can attest to his extracurricular dedication. “He is absolutely outrageous,” says St Mary’s College fullback David Fanagan, and one of Smeeth’s former Trinity disciples. “After the morning weights session he would go into his office to watch the footage from the weekend, then he would be off to Willow Park to coach and then come back to train our seniors. And in between he would be in his office watching RugbyDump or highlights on Youtube eating a burrito! Smeeth has travelled the world looking for ways to improve himself and his teams. He had two stints as the attack coach with the US Eagles and last summer spent time with the Crusaders to see how they do things. It wouldn’t be uncommon for his former players to see him observing at Leinster training either. As Trinity Rugby has grown, so too have their facilities. A state-of-the-art gym and pitch on campus has set players and coaches up for success. Smeeth advocates an expansive style of rugby for all his teams that is predicated on understanding and mastering attacking shape – or getting as close to it as his high standards will allow. “He is by far the highest level coach I’ve had. His attention to detail and focus on skills is absolutely insane,” Fanagan says. An example of that are simple passing drills done under intense pressure where real-time feedback is offered. Each and every pass is graded on a scale of 1-5. If Smeeth is screaming five, you’ve put the ball chest-high in front of your team-mate. A fraction to the inside or outside, you are getting a three. You probably wouldn’t hear Smeeth shout one, as he would be so aghast at the skills breakdown that he would be close to short-circuiting. Everyone has to hit a five. “He has trained teams so well in attack that they are a nightmare to play against,” Fanagan adds. Smeeth’s adherence to running rugby is so absolute that for a long time he wouldn’t let his Willow U13s kick the ball – under punishment of substitution. “I’ve changed slightly, in the last two seasons I’ve allowed an attacking kick because that vision is a mighty thing – but they actually haven’t kicked it this year,” he says of the players who will enter Blackrock College in second year. That expansive style was on display last month in a game that was arguably the high-point of Smeeth’s tenure. Trinity sliced open league-leading Cork Con like a surgeon’s scalpel in College Park, picking up a bonus point in the 37-13 win to give them breathing room in the playoff race. Their top-four place was confirmed in the sweetest way possible – claiming the annual Colours Game in UCD earlier this month, the first time a team has won away since the two colleges began alternating home advantage. Smeeth would love to lead his team to Division 1A glory but no matter how the season finishes – they face Cork Con away in the Division 1A semi-final – he will perform a ritual that has become notorious in Trinity. He will set aside the equivalent of three full days and deliver his end-of-season report cards to his players. Every aspect of their game will have been studied, digested and put forward for debate in Smeeth’s own inimitable way. “I’m quiet acidic. You just can’t compliment somebody totally – it’s like ‘you are a brilliant journalist… but’,” he laughs. In the quest for perfection, nobody is above evaluation. Smeeth proudly says he is a better coach now than he was five years ago. Old game plans are picked through dispassionately – ‘what the f*** was I thinking back then?’ – and he is a voracious reader of books about great coaches across all sports. So after helping build a top rugby programme from scratch, what is Smeeth?